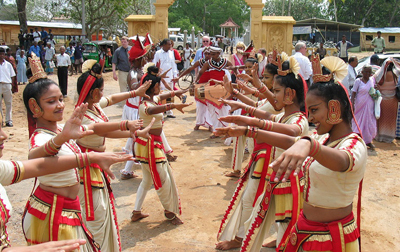 In Paraliya and Telwatta (Sri Lanka) the „Hameln-Pyrmont helps!“ action group of Interhelp  German Society for International Aid was the first foreign aid organisation with official permission from the authorities to commence re-construction on Sri Lanka. So far, 65 solid homes for flood victims have been built on Sri Lanka. „Hameln-Pyrmont helps!“ acted like a magnet, attracting help organisations from all over the world. 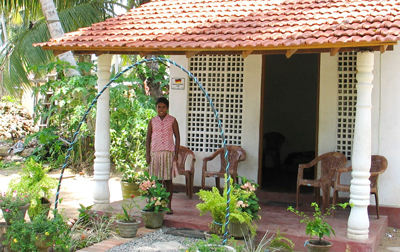 The houses were built under the supervision of the Ministry for Public Administration and Home Affairs, and with the asistance of „The Help Sri Lanka Consortium“. On 1 April the buildings were officially handed over to the survivors of the deadly flood by Minister Amarasiri Dodangoda, Jürgen Weerth, the German Ambassador and a delegation of the „Hameln-Pyrmont helps!“ action group. With the help of German industry the „Hameln Montessori School“ was built in Telwatta (Sri Lanka). The high priest of Telwatta temple gave „Hameln-Pyrmont helps!“ 2,000 m² of building land free-of-charge. A businessman from Emmerthal, Ekkehardt Golze, collected donations for this project, and it was his idea to build a pre-school unit plus communication centre. At Balapitiya District Hospital Interhelp works closely with the government’s District Health Officer, Dr. A.W.A.S. Piyaratne. The 500-bed unit, in which very many flood victims were treated, used to have only one phone. Since April 2005 the hospital has its own modern telephone system, donated by Deutsche Telekom, thanks to the Paramedic Instructor Michael Görbing (mfs Krankentransporte Frankfurt). Refrigerators to store blood units for transfusion and vaccines were also given to the clinic, financed by the pupils of Humboldt Grammar School, Bad Pyrmont. According to the Medical District Officer, several people had been dying every year because not enough blood could be stored, due to the lack of fridges. On Sri Lanka rescue services are virtually unheard of. The injured and sick are brought to clinics by Tuk-tuks, trucks or taxis. In cooperation with the Sri Lankan Ministry for Health and the German Embassy’s partnership office in Colombo, the German Society for International Aid (Interhelp) wants to set up a rescue service in Balapitiya as soon as possible (on Galle Road between Colombo and Galle). Our thanks are due to Mrs Margit Wunderwald of the German Embassy’s partnership office in Colombo, who makes tremendous efforts for the requirements of the needy. In Telwatta temple (Sri Lanka), which was used for weeks as a refugee centre, „Hameln-Pyrmont helps!“ action group set up a pump unit, which meant that the emergency toilets installed by the Indian army could be supplemented with a water-flushing system. In Paraliya, near Hikkaduwa, fishing boats, outboard motors and nets were required. „Hameln-Pyrmont helps!“ could make its contribution here, too – help for self-help. In the meantime, the fishermen can go out to sea again, to feed themselves, their families and others. In cooperation with the Johannes Gutenberg University of Mainz, the German Society for International Aid (Interhelp Hameln-Pyrmont) regd. association, carried out an anti-trauma project on-site in Paraliya in autumn 2005, lead by Dr. Manfred Domroes, a university professor. It bore the name „Plants for the Soul“ and its objective was the enhancement of the mental and physical wellbeing of the tsunami survivors. With the assistance of the German Embassy on Sri Lanka, the Federal Agency for Technical Relief, a unit of the German Home Office, and the German Society for International Aid (Interhelp Hameln-Pyrmont) regd. association, applied to the United Nations for the financing of household goods and furniture. Flood victims who had received a house were to be given an assistance voucher for US $ 320 to purchase these items. Interhelp constructed a clinic waste-incineration unit at Balapitiya Hospital on Sri Lanka, under contract to the State of Lower Saxony. For the Lower Saxon Ministry for the Environment Interhelp is implementing the „Clinic Sewage Works“ project on Sri Lanka. 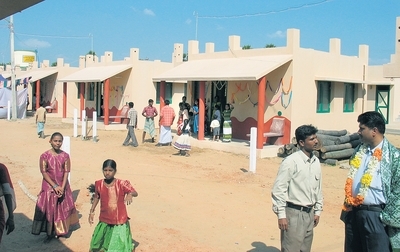 In Pudupettai, on the southeast coast of India, (Federal State of Tamil Nadu), the German Society for International Aid built 30 solid houses, along with their partners SOS India. On 29 January 2006 they were handed over to flood survivors. Together with the Rotary Club of Yogjakarta, Interhelp re-built a school which had been destroyed in a terrible earthquake on the Indonesian island of Java. In Bulgaria, (eastern Europe), Interhelp looks after needy senior citizens.